The last time I inspected the hive, the bees had begun feasting on the edges of the new wax foundation in the honey super, which was completely opposite of what I wanted them do–build beautifully sculptured comb on the foundation to fill with honey. Needless to say, I was actually a little worried after the last inspection because the hive needs at least 60 lbs of honey to make it through a winter, and they were eating away their chances of storing any. At an attempt to increase the building of comb, I left the hive alone for a couple of weeks and amped up the feeding, and I was excited to open the hive today and observe fully drawn frames with some capped honey. The queen is still laying as well. 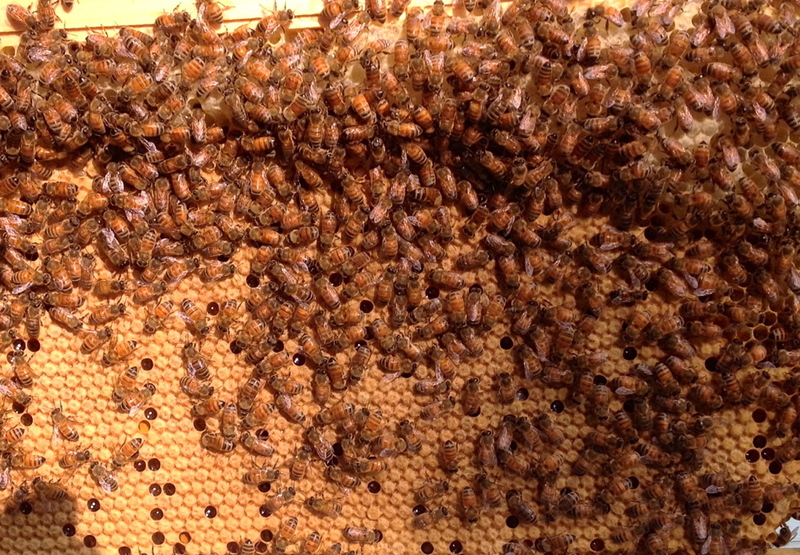 The picture below shows a frame with a solid brood pattern; the bees in these capped cells will emerge in the next couple of days to join the bustling hive.